Following allegations that Kevin Spacey made a sexual advance toward an underage actor in 1986, more accusations of misconduct have surfaced. Filmmaker Tony Montana tells Radar Online that Spacey groped him in 2003 while the two were at a bar in Los Angeles. “I went up to order a drink and Kevin came up to me and put his arm around me,” Montana says. “He was telling me to come with him, to leave the bar. He put his hand on my crotch forcefully and grabbed my whole package.” Montana says Spacey then told him, “This designates ownership.” After Montana removed Spacey’s hand from his crotch and left, Spacey allegedly followed him into the bathroom. Montana says Spacey appeared intoxicated. “I backed him out the door and I pushed him,” he says. “One of his friends was in line and I said, ‘It’s time to take your boy home.’ They all ended up leaving.” Montana says he previously spoke about the alleged groping only to his therapists and that he suffered from PTSD in the six months after the incident. Actor Roberto Cavazos, who performed at London’s Old Vic where Spacey served as artistic director from 2004 to 2015, claims Spacey routinely preyed on young male actors at the theater. “It seems the only requirement was to be a male under the age of 30 for Mr Spacey to feel free to touch us. It was so common that it even became a local joke (in very bad taste),” he wrote on Facebook. 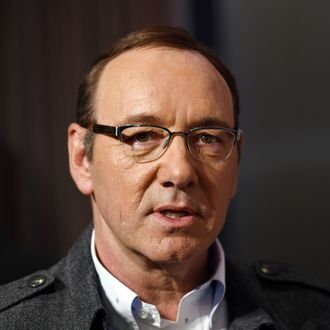 Cavazos describes multiple stories of Spacey arranging “picnics” at the theater with actors to discuss their careers where he would inappropriately touch them. “I myself had a couple of nasty encounters with Spacey that were on the verge of being called harassment. In fact, if I had been a woman, I probably wouldn’t have hesitated to identify [them] as such,” he wrote. Cavazos says there are likely to be more accusations made against Spacey from people who worked at the Old Vic, and that he “wouldn’t be surprised if they were numbers like Weinstein.” In a previous statement, Spacey said he could not recall the alleged incident with the minor but apologized.